Here's the deal; chia seeds have mega benefits. That's right, MEGA. Fiber, Omega-3's, Magnesium, Calcium, Protein (that's right, vegans do get protein! ), and a bunch of other awesome things that you can read about here if that's your thing. If it's not, then that's totally cool too. You don't need to know about all the benefits of this snack. All you need to know is that it's mega delicious. That's right, MEGA. Chia pudding is literally whatever you want it to be. 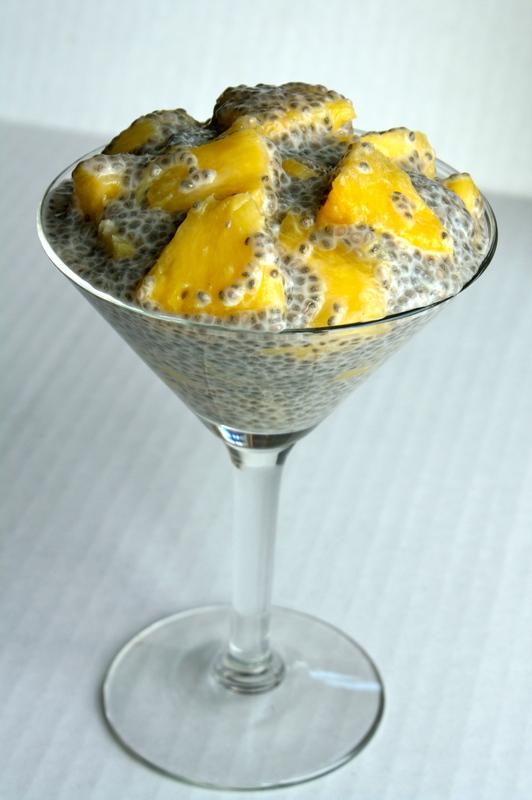 The chia seeds creating a gel like consistency and don't have much of a flavor alone which is great because they're super easy to add to anything and everything. Today's special; pineapple! Let's get going so that you can get eating. Stir together the milk and the chia seeds. Place in the refrigerator for an hour or so. Stir, adding pineapple. Place back in the refrigerator for another 1 or overnight. Remove from refrigerator. Serve, enjoy!